The best and most suggested way to get into exercising is to get in it before the busy schedule starts. If you already know that the day is going to be tiring and you might not be able to find time to exercise, it is better to choose early hours to sweat. You can decide to get up early before your kids and do proper workout so that even after a hectic day you can be sure that you’ve managed your exercise time properly. Planning the exercise is way more important than you think it to be. Experts suggest that you need to make a proper plan for the exercise before you actually get into exercising. Making a working plan will help you in order to have a clear idea of what you are going to do and how you are going to manage everything on a daily basis. 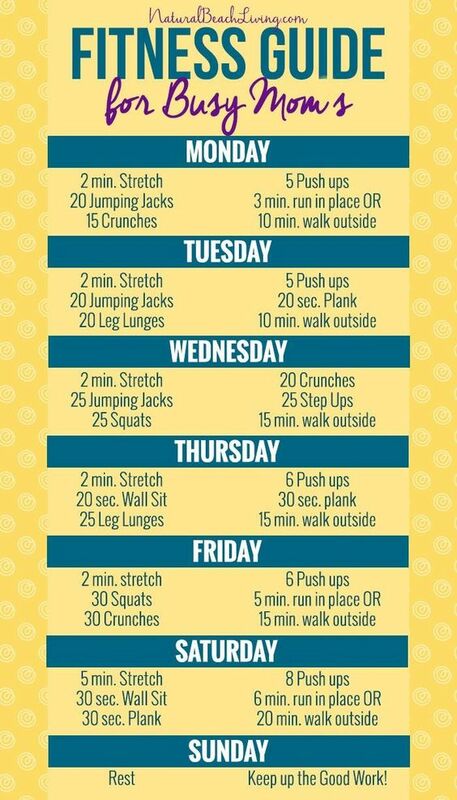 Once you are doing with the workout plan, now comes the time to put it in the daily schedule. When you’ll try to figure out the free time that you get throughout the day, you will be quite amazed to find that there is plenty of it and you’ve been ignoring it all this while. After choosing the free time from the day, now implement the exercise schedule in your daily routine. Another important thing with the scheduling is the tendency to stick to it throughout by staying properly motivated. With the internet connectivity in your hands, you don’t really have to go out anywhere to decide what you need to do with the exercise. You can read some blogs or watch some YouTube videos to know about various exercising ideas according to your body requirement. Doing proper research before getting into exercising will be extremely helpful in saving the trouble of unwanted confusion related to the workout plan. Running after kids the whole day will hardly let you take out separate hours for the workout so the best idea is to include the kids in your exercise plan. 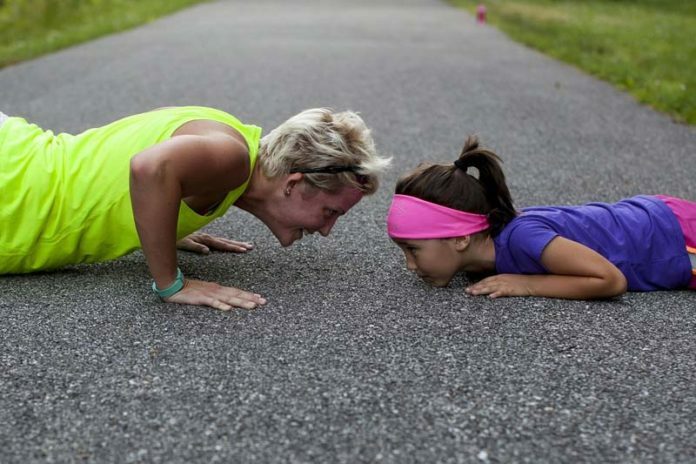 This will not only help to set a good example before them but will also help you bond with them in a better manner as exercising with kids is known to strengthen the mother-child relationship to a great extent. Apart from this, exercising with kids will also improve their health and as a mom you will be quite happy with this. Another nice idea is to workout with your partner because it turns out to be an amazing way of bonding. If you find your daily routine very busy and hectic, stealth workouts are going to be very beneficial for you. Whenever you get some free time, get engaged with exercising and you will find out that you can do a lot this way. You can choose to do some crunches while kids are busy with their toys or can decide to do some squats in your free time. The idea of fitness dates is certainly a wonderful way to improve your health while socializing with your friends at the same time. You can ask other moms to go out on fitness play dates with you and can take the kids along. Kids can have their play time while mothers are engaged in exercise. You can even decide to drop the kids at school or daycare and enjoy your fitness date without getting disturbed anymore. Whenever you take your kids to the nearby playground and spend your time watching them playing around while you are sitting on a bench, you can utilize this time to get engaged with them. You can choose to have a walk or jog while they are playing. Another nice way is to get involved in the gardening and burn these extra calories while focusing on the greenery at the same time. You can also involve your kids while you’re in the garden. After this discussion, it becomes clear that finding out time for exercise can be managed. A bonus tip is to take proper rest at the end of the day so that body can get relaxed. Choose a suitable mattress according to your body requirement and it is suggested to do some market research to know more details about various types of mattresses to get better sleep every day. How do I find time to exercise as a busy mom? How I Find Time to Workout! | Busy Work-at-Home/Stay-at-Home/Homeschooling Mom! Previous articleIs Exercise Bad for Acid Reflux?